A few years ago my coworker Alex was describing a friend of his — let’s call her Anya. While Alex sat in Anya’s kitchen he watched as she removed a homemade pie crust from the freezer, rolled it out, peeled and sliced a few Cortland apples right into the middle of the dough, sprinkled them with cinnamon, butter, sugar, nutmeg. A little more sugar. A little more cinnamon. Hmmm, maybe a squeeze of lemon. Yeah, that works. Then she folded the crust around the little pile and popped it in the oven. And the whole time Anya was improvising her baked apple pastry she was engaged in a conversation with Alex about Frank Rich and Thucydides and also her novel that — whaddayknow! — just hit the New York Times bestseller list. OK, I’m making that last part up. But in my mind this Anya woman has become something of a goddess to me. Even though I’ve never met her and even though her name is probably not Anya. She just embodied that person who I want to be in the kitchen — the person for whom everything comes so instinctively and effortlessly. The person who doesn’t bake a pie in a pie dish or even use a bowl to mix sugar into apple-pie apples! Needless to say, from that moment on, it is the only way I’ve ever made an apple pie, which is technically known as a galette, which in my house is now technically known as a gazette because that’s what Abby called it by accident and it just seems so much cuter. Don’t you think? My favorite thing about this recipe is that it does not yield a whopping monstrosity of a dessert that sits on the counter and gets picked at all week long. It’s just the right size for a family of four to each have a single modest serving. Preheat oven to 425°F. If you have a ball of Martha Stewart’s pate brisee in the freezer, lucky you! If you don’t, remove a 9-inch storebought frozen pie crust (such as Pilsbury) and thaw. Peel and slice about 3 to 4 apples (Cortland, Granny Smith, Jonathan, Northern Spy, McIntosh are excellent pie-baking apples) into the center of the crust, leaving about an inch border around the perimeter of the dough. Sprinkle the apples with about 1/4 cup sugar, a few shakes of cinnamon, a pinch of nutmeg, and a squeeze of lemon juice. Using your hands, toss everything together gently, then fold the crust over the apples as shown. Dot the apples with butter and brush the crust with milk or a beaten egg. (This is an excellent task for kids.) Bake for 20 minutes. Then turn down heat to 350° and bake another 20 until crust is golden and apples are a little bubbly. 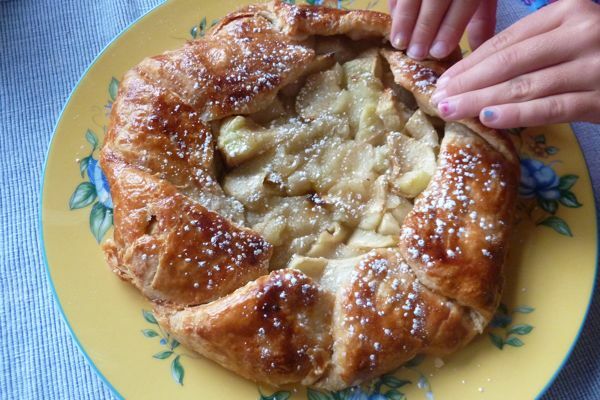 If the crust is looking too brown before the apples are bubble, cover the galette with foil. Once the galette is cool, Abby likes to sprinkle it with powdered sugar, but this is not required. And I think I will make this today!!! I found a Barefoot recipe for summer fruit galette that I used ALL the time last summer. It is so simple and easy to throw together and impresses the pants off last minute guests. I always try to have half a dozen individual pie crust sized packages of pastry in my freezer. I sometimes just make a quick roux and throw in whatever leftovers we have in the fridge and top french onion soup bowls with the pastry. Instant individual pot pies and my husband goes crazy for them. Seems like a treat and takes minutes! galettes are so simple and delicious. (and oh so very french…) i’m a fan. I love learning to cook this way from you. I hope you keep going with the “guidelines not recipes” approach. Oh, AND, I love that you get the idea of wanting a smaller, family-sized sweet instead of the standard 9-inch pie. It doesn’t always have to be the way it always was! What a fun story. I, too, am a lover of the “recipe that has no recipe” approach to cooking. I need this tonight…and I happen to have a trader joe’s pie crust in the freezer. Jenny to save the day again. I just started making gallettes this week. Can’t seem to tear myself away from the nectarine and blackberry variety. Soooo good. Good to the Grain has a recipe for whole wheat pie crust that I am really digging these days. I am going to try this tonight with fresh red plums, granny smith apples, and nectarines. I love this!! Oddly enough, my kid are named Alex and Anja (German spelling). So I’ll have to give this a try! Made this for dessert last night – perfection!!!! Made this last night with plums, a nectarine, and agave instead of sugar. Delish! We are living overseas this year in a “furnished” house that, not surprisingly, doesn’t have a pie pan. Hooray, you’ve just made good old American apple pie possible for this expat family! So pretty and elegant. Good, too. We tried a pear version and it was perfect. I’m making it for friends who are coming for dinner tomorrow.